Skype(s MSFT) updated its client for Android devices on Tuesday, bringing improved audio quality to the video and voice calling application. Skype added support for its SILK audio codec which uses wideband audio for better sound. The new software version is also designed to work better on the larger screens of Android(s goog) tablets. As before, Skype still works on either a Wi-Fi or mobile broadband connection and can be used to send files or have text chats in addition to the video and voice calling functionality. I tested the new Skype software on several of my Android devices, both tablets and phones, and with headphones on, the call quality did sound better. But I also ran into two issues. First, none of the microphones on my headsets seemed to work; callers couldn’t hear me when I was using headphones so I had to revert to speakerphone use. I had callers try their headsets and they experience the same issues. Second, there is a video problem related to screen orientation. For nearly all calls, both participants needed to hold their phone in landscape. 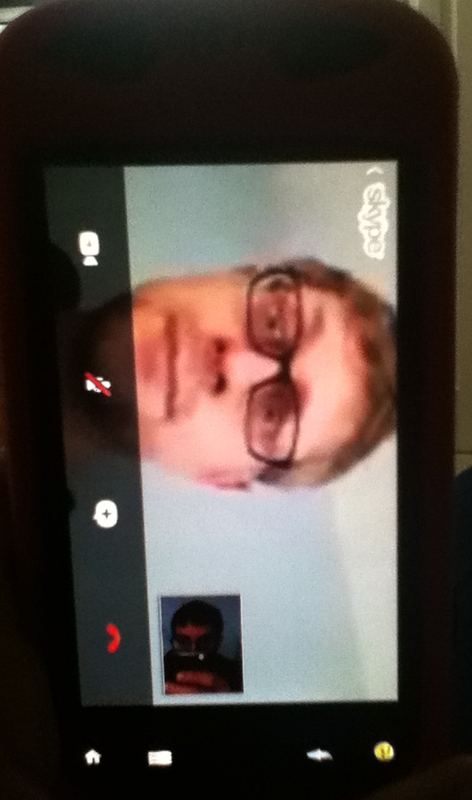 Only one time could I actually get my client to properly switch to portrait mode in a video call. Every other time would result in one or both callers turned sideways, or even upside down. Here’s a pic my son snapped of his phone to show the issue. Skype says the new client supports Android 2.1 devices with an 800 MHz processor or better. My test devices all easily exceeded those requirements: a Galaxy Note 2 and Nexus 7 tablet. My colleague, Stacey Higginbotham, helped me test with her relatively new Samsung Galaxy S III, while my son Tyler had the weakest test device of the bunch: A T-Mobile MyTouch Slide 4G built by HTC. Perhaps the issues we experienced are the result of an early build or are device specific; possibly the result of Android available in so many different hardware and software configurations. As a result, the new Skype client may work fine on your Android device. And even if you do have video call issues, the voice calling experience is still quite good, provided your headset works as well. Nice looking update. But I also noticed the app ran a little too slow for than expected, especially while launching the app the splash screen stays on for a good 8-10 seconds. Either way, try it out for yourself. Or if you are an Android lover and looking for an aternate solution – You can try an HVD app. Which enables you to run complete Microsoft Windows 7, Office 2010 and yes Skype too..
Any other alternate you think we (the Android geeks) have? Please do share. TringMe for android is best sounding voip application right now. Better than Skype.